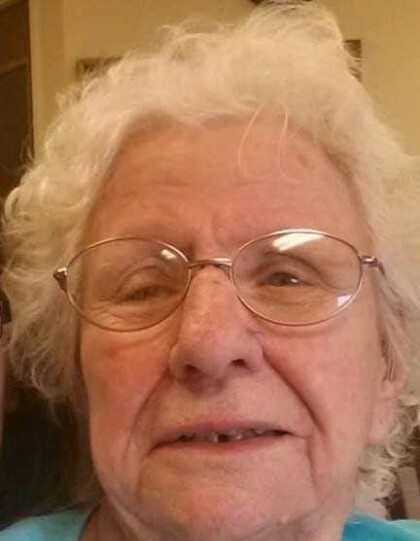 Obituary for Edith V. Peterson | Hile-Best Funeral Home, Inc.
Edith V. Peterson, 95, of Greenville, formerly of Seneca, passed away Tuesday morning, February 5, 2019 at St. Paul's Nursing Home in Greenville. She was born in Seneca on June 6, 1923 to the late Millard William and Lottie (Strain) Vandermark. She was a former member of the P.N.A. Club in Oil City. Mrs. Peterson was affiliated with the United Brethren Churches in the area. Edith enjoyed quilting, sewing, traveling, and time spent with her many grandchildren. In her earlier years, she was employed by the Oil City Glass Plant, later worked in the kitchen and dining room at Polk Center, and was also a bartender and a cook at the Valley Lunch in Rouseville. She was married in 1945 to Cecil E. Peterson, and he preceded her in death in 1989. Surviving is a daughter, Shirley B. Xander of Greenville; seven grandchildren: Albert Stuart, James Moyer, Theresa Moyer, Tina Shatto and husband John, Ronni Lencer and husband Tim, Tammy Geibel and husband Keith, and Lori Bartelone and husband Paul; and thirty great-grandchildren and twenty-two great-great-grandchildren. Also surviving is her sister, Ada Hogue of Oil City; and numerous nieces and nephews. In addition to her parents and husband, she was preceded in death by a daughter, Ruby Moyer; a grandson, Bill Moyer; a great-grandson, Gregory Moyer; three great-great-grandsons, Michael Moyer, Steven Wimer, Jr., and Grayson Wimer; three brothers, Eugene, Edward, and Millard "Jake" Vandermark; and a sister, Dorothy O'Brien. Friends and family will be received Friday (Feb. 8th) from 11 a.m. until 1 p.m. in the Hile-Best Funeral Home, 2781 Rte. 257 in Seneca, Cranberry Township, where the funeral service will follow Friday (Feb. 8th) at 1 p.m. with Pastor Gary Small, associate pastor with Atlantic Ave. United Brethren Church, officiating. Private interment will be in Heckathorn Cemetery in Seneca.